Wearing: Erin Fetherston Dress, Agent Provocateur stockings/cardigan, Forever 21 Mary Janes. 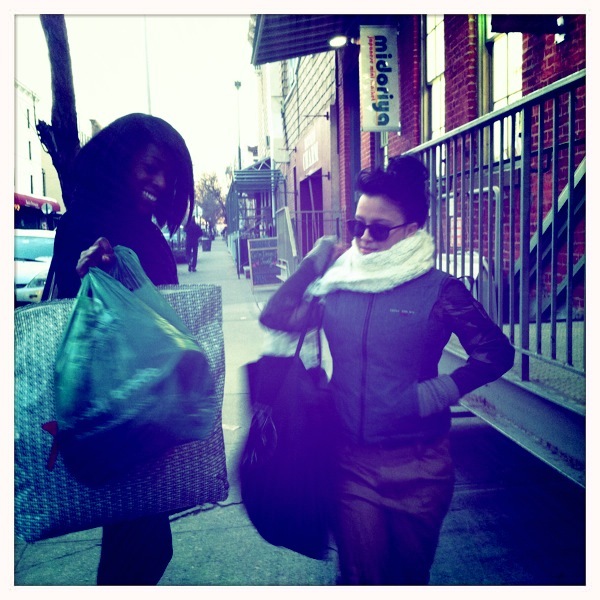 The other day I headed to Buffalo Exchange with my friends Ingrid and Mimi to donate some stuff. Of course when you donate to Buffalo Exchange you end up buying more stuff to bring back home with you. I think Ingrid and I ended up doing pretty well, we didn’t get too many things, but Mimi on the other hand came back to Buffalo the next day lololol. The highlight of my day was finding this beautiful fuchsia trench coat and a cute bunny ring. 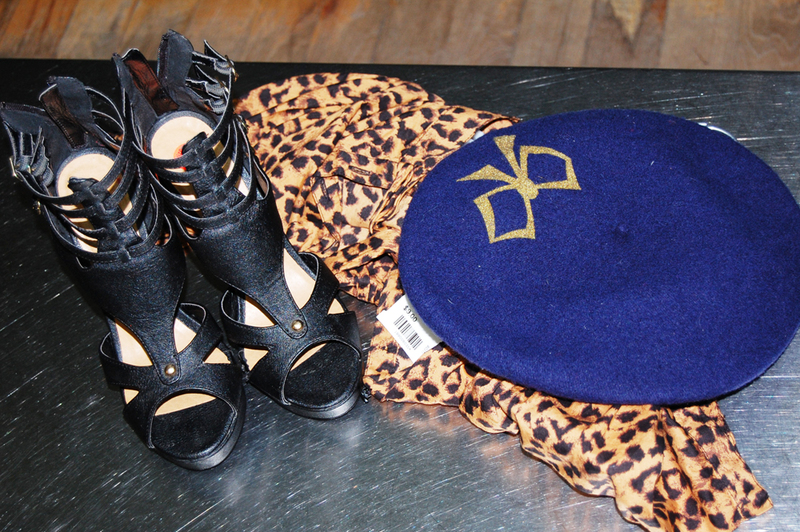 Ingrid found a great pair of heels, a cute beret, and a great top amongst other things. Mimi found this fabulous fur coat and a cute skirt, but went back the next day to purchase anoottther fur coat lol I love her. Here are pictures of our day. This was my outfit, I was all dolled up because I had a dinner to attend after my shopping rendez vu with the girls. Ingrid found a great vintage looking Polo top and a great brown belt to match. I found this cute American Apparel skirt, Ingrid has it and I died over how cute it was and found it here. I also found this cute skirt but it soon rubbed off on me so I handed it over to Mimi. It looked great on her! I also found the jacket she’s wearing, and they both look great on her! I must have subconsciously been shopping for Mimi instead! I wasnt sold on getting this vintage dress at first, I felt like a fry cook lol. But after having the girls tell me that I better get it and having a gun to my head I said ok lol. I think this will be good for a photo shoot. Ingrid found this cute yellow floral cardigan, I love her in yellow! I love this Bebe trench coat and every time I put it on I felt the other customers burning holes with their eyes every time I put it on. I swore they were going to jump me for it. This is what Ingrid was actually wearing, aint she cute? We were about to checkout when Ingrid stumbled upon these great shoes. Then I found her a leopard top and beret. What can I say, I know my girls! At the checkout I saw a cute little bunny ring I couldn’t resist! Look at the red eyes! heres a comment to match your many hits ….i need to go shopping with you soon. Such cute things! The bunny ring is my fave. I just discovered your blog and like you, I love vintage clothing and making vintage reproductions. Consider me your new subscriber. I added you to my blog roll as well : D.
Still gagging over your coat! And looking at that skirt up there I’m happy you forked it over! But please get me help they know me over there now it’s ridiculous. But on the bright side, this experience made me realize that there are so many old clothes that I was hanging on to that really wasn’t conducive to my wardrobe. I say everyone follow the “If you don’t wear it in a year give it away” rule. It feels good. Someone else might appreciate it. And whatever Buffola Exchange didn’t take they donated to homeless shelters and I held on to the unwanted summer pieces for needy people in Haiti. 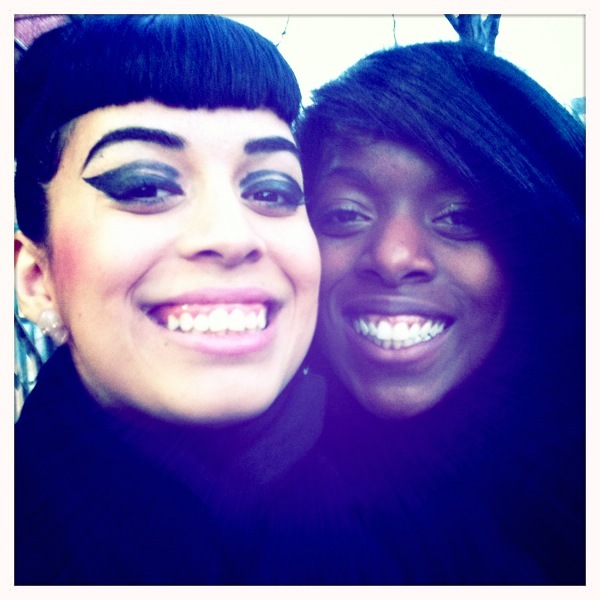 I neeed to go shopping with you when I come to NYC…you always find the things I would have never of seen!! I have those shoes and never know what to wear them with.